My tea sandwich recipes are deliciously different and guaranteed to make you the life of the tea party! Looking for something to serve at your next tea party? Tea time would not be complete without tea sandwiches! 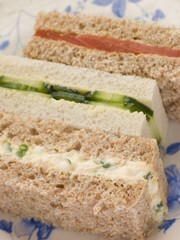 Tea sandwiches are dainty, snack-sized finger sandwiches that are traditionally served with afternoon tea. These delicacies usually have the crusts cut off and are sliced small, so you can polish one off in just a couple of bites. You can even cut them into fun shapes using cookie cutters! Bananas Foster Tea Sandwich . All the flavors of the classic French dessert, presented in a dainty tea sandwich! Curried Chicken Salad Tea Sandwich. Taste a little bit of India in this tea time classic! Muffaletta Tea Sandwich. Jazz up your next afternoon tea with this delicious bite-sized version of the traditional New Orleans favorite. Step 1. Put the cream cheese, rum or rum extract, ¼ teaspoon cinnamon and 2 tablespoons of brown sugar into a large mixing bowl. Using a hand mixer, whip the cream cheese on high speed until smooth. Set aside. Step 2. Melt ¼ cup of the butter in the skillet. Add the bananas and sprinkle ¼ cup of brown sugar over them. Step 3. Cook the bananas on medium high heat, stirring frequently, for 5 minutes, or until they are soft and the butter and brown sugar have caramelized. Step 4. While the bananas cool, butter 1 side of each piece of bread. Step 5. Spread the cream cheese mixture on top of the buttered side of the first 8 pieces of bread. Step 6. Spread the banana mixture evenly on top of the cream cheese. Step 7. Sprinkle additional cinnamon and sugar on top of the bananas, and drizzle with caramel syrup. Step 8. Top with the remaining slices of bread, buttered side down. Step 9. Cut the crusts off of the sandwiches, and cut them in half vertically. Step 10. Cut them in half again, but diagonally this time, to make 32 sandwiches. Step 11. If not serving immediately, keep chilled. An old favorite with an exotic twist! Step1. In a large bowl, combine the chicken, nuts, celery, cilantro/coriander leaves, onion and yogurt. Drizzle lemon juice on top and stir well. Step 2. Add the curry powder, a teaspoon at a time, to suit your preference. Stir until all ingredients are evenly mixed. Chill for several hours or overnight. Step 3. Butter one side of each slice of bread. Step 4. To assemble the sandwiches, spread the curry mixture evenly over the buttered side of the first 8 slices of bread. Top with the remaining 8 slices, butter side down. Step 5. Use sharp knife to cut the crusts off of the sandwiches. Slice them in half vertically and then in half again diagonally, to yield 32 tiny sandwiches. Bring a little bit of New Orleans flair to your next tea party! Step 1. It’s best to make the olive salad the night before, to let the flavors blend. Step 2. To make the olive salad, combine the ingredients in a food processor and process until everything is minced together. Step 3. Place the olive salad in a bowl and let it chill for a few hours or overnight. Step 4. To assemble the sandwiches: Spread olive salad evenly across the first 8 slices of bread. Top each with 2 slices ham, 1 slice of salami and 1 slice of provolone, and then with the remaining bread. Step 5. 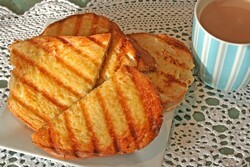 Melt the butter in a skillet, and grill both sides of each sandwich until they are golden brown and the cheese is melted. Step 6. Let the sandwiches cool, and then cut the crusts off. Step 7. Cut the sandwiches in half vertically, and then in half again diagonally, to make 32 mini-muffalettas! These are great cool or you can reheat them in the oven before serving.